In this insecure economy, you may be suffering on-the-job stress. But if your boss is not trying to have you killed, you're one up on Walter White. At the end of Breaking Bad's third season, Walt (Bryan Cranston), a high school chemistry teacher turned crystal-meth maker, fell out with his boss, Gus Fring (Giancarlo Esposito). So Gus put out a hit on him and his partner, Jesse Pinkman (Aaron Paul). As Season 4 begins (July 17 on AMC), Walt has survived, but his professional situation is, shall we say, tense. In a scene shooting on Breaking Bad's Albuquerque, N.M., set, Walt's estranged wife Skyler (Anna Gunn) asks him if he's in danger. He's insulted; in his mind, he's a player in the drug world, as big a threat as anyone. "Who are you talking to right now?" he demands. "Who is it that you think you see?" That is the question. When the world looks at Walt, it sees a tired, unemployed, middle-aged man. Breaking Bad viewers see a man who has made millions in the drug business, killed rivals and dissolved their bodies in acid. He is a pawn, and he is a kingpin. He is a nebbish, and he is a murderer. To paraphrase a quote that creator Vince Gilligan uses to sum up his show, he is Mr. Chips, and he is Scarface. The true identity of Walter White is Breaking Bad's philosophical long game. Is he a good man who turned bad? Has he always been bad? What keeps any of us from doing evil besides need and opportunity? It is this kind of investigation that makes Breaking Bad TV's reigning best drama and, despite its premise, its most intensely moral one. When Breaking Bad debuted in 2008, it seemed like a dark comedy along the lines of Showtime's suburban pot-dealing show Weeds. Walt, a chemistry genius whose career fizzled out, is teaching kids he resents and working part time at a car wash  then he gets diagnosed with lung cancer. Desperate to build a nest egg for his family before he dies, he partners with Jesse, his former student and a small-time dealer, to cook meth. It turns out he's amazing at it. And it feels good. He stays in the business even after his cancer goes into remission. "He wants to own this," says Cranston, who's won three Emmys for the role. "He's feeling powerful for the first time in his life." As Walt gets in deeper, embracing his criminality and signing on to run Gus' pharmaceutical-grade-meth superlab, Breaking Bad becomes something incredibly compelling  and dead serious. This evolution, says Gilligan, a former X-Files producer, was by design. "In the early going, the audience understands the absurdity of the whole situation  a middle-aged man willing himself to become a drug king," he says. "As he succeeds, organically the story must become darker, unless you want to do the Hogan's Heroes version of being a meth cook." Breaking Bad is the kind of TV show that gets described as cinematic, and that's true in the literal sense: it looks like a movie. The astonishing landscape of New Mexico gives the show a western-film starkness and scale. "When you're here," says cinematographer Michael Slovis, "you can't help but be affected by the size of the sky." The sets are painstakingly built, especially the superlab: a temple of gleaming metal tanks, painted infernal red, that production designer Mark Freeborn built with the aid of a Drug Enforcement Administration consultant. 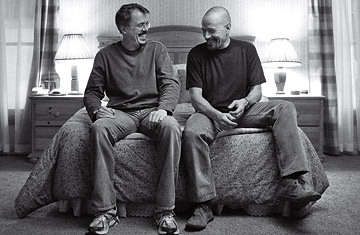 The lab, Cranston says, is a metaphor for Walt's compartmentalized worldview: "It's clean. It's isolated. He doesn't like being reminded that he's part of a messy, bloody business."